It is our pleasure to invite you to the annual N&G Conference taking place in the beautiful former Amsterdam Stock Exchange on March 2-4, 2017. 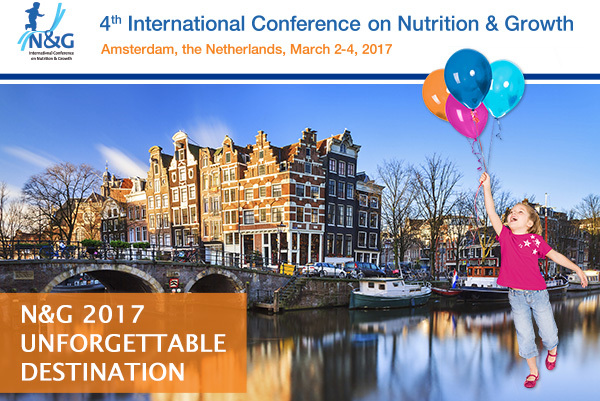 Participate in N&G 2017 and make the conference an enriching experience that will influence the future of Nutrition and Growth in the pediatric age group. This is your chance to create partnerships on a local, European and international level. Hear from N&G participants and speakers on what to expect at the 2017 Conference. Explore the comprehensive scientific program online. Remember to Submit an abstract to be reviewed by the expert faculty. Save up to €95 today and Register your place at the conference. Use official accommodation partner to Book your accommodation at discounted rates. Look forward to an outstanding opportunity to Network with like-minded professionals.